I am researching if I can host multiple domains on one server through HTTPS but for each domain, I have a different certificate. In this case, I would need to know the domain of the incoming connection so in that first part of the SSL handshake, will it have the information I need to send back the correct certificate for that domain? Yes, as long as the server and the clients support the Server-Name-Indication (or SNI) extension. This extension allows for virtual hosting for HTTPS, where you have multiple independent domains and certifications bound to a single IP address. Most clients these days do support SNI. The place where you might have issues is if you have older clients using platforms like Windows XP, old versions of Android, or Java 6. With SNI, the domain first appears in cleartext in the Client Hello of the TLS handshake (In the SNI field). Source: I fired up apache2 with TLS and took packet captures before and after implementing SNI (Virtual Hosts in apache2). Aside from SNI, there is an option to get a multi-domain certificate. 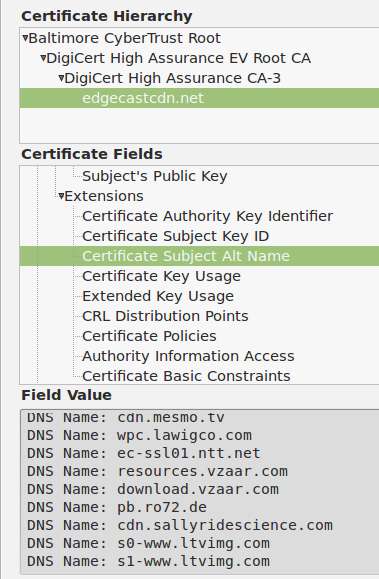 Several certificate providers offer such certificates (not endorsing anyone, Google is your friend). With a multi-domain certificate, you don't need to know the domain name at the beginning of the handshake, as the certificate is effectively valid for all the domain names listed. Is it technically possible to configure two different SSL certificates for the same domain?